Ian Grant Garrow was born in South Africa on 24 August 1908. His father, Alexander Garrow, had been a doctor at the Royal Infirmary in Glasgow but he served with a medical unit in South Africa during the Second Boer War and apparently liked the country so much that he returned there after the war ended. He married Jennie Guthrie, a nurse from the Royal Infirmary, at Port Elizabeth in 1904 and they had a practice in the little farming town of Steytlerville. Throughout the First World War, Alexander served with the South African Medical Corps but in 1919, the family returned to Glasgow. Ian was educated at Glasgow Academy and Glasgow University. He joined the OTC and became 2/Lt I G Garrow in May 1930. He served with the Glasgow Highlanders (TA) for the next ten years, reaching the rank of Captain. In 1940, shortly before leaving for France, Garrow was transferred to the Highland Light Infantry. On 16 June 1940, four days after the surrender at Saint-Valéry-en-Caux, Captain Ian G Garrow was in charge of a transport company with B Echelon of his HLI Battalion (under the command of Major McClure) at Breteuil, south-west of Évreux in Normandy. Next day their position was surrounded by German troops. The company destroyed the engines of their vehicles and divided into smaller groups. Garrow took eight men (see below) and headed south, sleeping the first night in a wood. On about 22 June, they reached Saint-Julien-sur-Sarthe where a Frenchman told Garrow that France had signed an armistice with the Germans. Garrow decided to try and make for the Normandy coast and ultimately, the Channel Islands. He further divided his group into threes, taking Alex Cattrell (HLI) and Eddie McDonald (Glasgow Highlanders) with him, and headed west. They reached Mayenne where they learned from a newspaper that the Germans had occupied the Channel Islands, at which point Garrow decided they should head for Spain. They walked to Vouvray, just east of Tours, where they persuaded a farmer to ferry them across the river Loire and then another to take them over the river Cher (and the new demarcation line) from St Martin-le-Beau. They then walked overnight to Loches and Châtillon-sur-Indre where Garrow reported to the French Commandant. The three soldiers were sent to Chateauroux and then interned at Bélâbre. The eight men with Garrow were Pte Alex Cattrell (260) Pte J McLaren (955) Pte E MacDonald (959) Pte Harold Pool (LIB/1772) Pte D Campbell, Sgt Craig, Pte Greer and Pte Riley. Cattrell was later passed as unfit by the Mixed Medical Board in Marseille and repatriated to England in March 1941. McLaren evaded in France until evacuated by felucca from Canet Plage in October 1942 on Operation Rosalind. MacDonald escaped from Fort de la Rivère in September 1942 and was also brought out on Rosalind. Pool also escaped from Fort de la Rivere but was recaptured three days later - he and Campbell were transferred to Italy in December 1942. I have no information on the other three men and assume they were captured in Occupied France and sent to Germany. Bélâbre was not an internment camp, it was simply a small French town where a Battalion of Senegalise troops were stationed under a Cmdt Albinet. The town was crowded with refugees and the British officers were lodged with local families, and their meals taken in a hotel. There were five other army officers at Bélâbre when Garrow arrived : Lt H S M Hogg (80) Lt William Sillar (122) Capt Frederick Fitch (181) Capt Bill Bradford (382) and Capt P P Raikes (killed in a Vichy French air raid on Gibraltar in September) and about twenty ORs : including Dvr D C Wilson (264) and Spr L L Lines (967). Soon after Garrow arrived the British internees decided that in the absence of any decisions as to their eventual fate, they would leave. The other officers left first thing after breakfast (probably on 27 July) but Garrow waited until the men had their lunch before leading Cattrell and McDonald south through Limoges and Sarlat to Limogne-en-Quercy, near Cahors where they were arrested by gendarmes and handed over to the military authorities in Toulouse. From Toulouse they were sent to the POW camp of Monferran-Savès near L'Isle-Jourdain, where they were reunited with some of the other escapers from Bélâbre – none of whom succeeded in escaping from France on this occasion, although several came close. In October (report dates vary) the internees at Monferran-Savès were transferred to Fort Saint-Jean at Marseille. This was the old fortress in the Vieux Port that was intended to be home for all the British military internees held in France. In Marseille, it was Captain Freddie Fitch (181) who was in charge of the escape attempts, helping men across the Pyrenees to Spain, working with Lt William Sillar (122) until September, and making contacts and gaining valuable experience. When Fitch himself left in December, he left the embryo organisation in the hands of Captains Leslie Wilkins (354) Charles Murchie (681) and Ian Garrow. Leslie Wilkins reports handing in his parole at Fort Saint-Jean in December and taking up quarters in Marseille where he continued to work with Murchie, Garrow and Tom Kenny. This was also when Garrow started to make friends with some of the local residents of Marseille, in particular Louis Nouveau and Dr Georges Rodocanachi. In her post war account, Nancy Wake (Mme Nancy Fiocca as she was then) described Garrow as very tall, strongly built, clean shaven and good looking – a Scot of great charm. Although the literature covering this subject varies greatly in terms of verifiable accuracy, everyone seems to agree that Ian Garrow was a man who inspired confidence and great loyalty among those who worked with him. His only failing as an undercover agent was that his appearance, mannerisms and speech were unmistakably those of a British officer. This may have been why the French authorities allowed him to operate so successfully for so long as they could not believe that someone so obvious could really be the head of a secret organisation. December 1940 and into early 1941 was also the time when Charles Murchie was at his most active but it would seem that he and Garrow almost went their separate ways. Most contemporary accounts of this time name Murchie as the man in charge, very few even mention Garrow, but subsequent literature by Louis Nouveau, Nancy Wake, James Langley and so many others who worked with (or later knew) Garrow, largely ignore or even denigrate the huge contributions made by Murchie and Harry Clayton (701) until their departure for Spain in April. It is difficult to work out exactly what Garrow's position was in the organisation at the beginning of 1941. 2/Lt Richard Broad (284) says in his MI9 report that when he arrived in Marseille in February, he met Donald Caskie, Leslie Wilkins, Tom Kenny and Louis Nouveau, that Charles Murchie acted as their chief and Garrow was their liaison between Ste Marthe (the barracks where he and his men were held) and the US Consulate. Courier Roland Lepers says Murchie was his only contact in Marseille and Harold Cole reports that Murchie was his contact in Marseille until he was replaced by Garrow, who Cole first met at the American Consulate, probably in April. I don't know what status Garrow, and Murchie before him, had in Marseille but visitors to the US Consulate at 12 Blvd Paul Peytral (now Place Varian Fry) in 1940 and early 1941 would be directed by Hugh Fullerton or Major Dodds either to the Seamen's Mission on rue Forbin or direct to them. Later they had, or had the use of, an office in Room 18 at the Consulate. There is little doubt that by May 1941 at the latest, Ian Garrow - who gives his address at that time as 13 rue des Phoceens, the same address as Nancy Fiocca - was the man in charge of the Marseille organisation. By this time, Garrow was the only British soldier left working in Marseille. The internees at Fort Saint-Jean had been moved to Saint Hippolyte-du-Fort and the other servicemen had left for Spain or North Africa. There was a still a steady stream of escapers and evaders brought down from the north by Lepers and Cole (and others) and passing through Marseille but the organisation in the city was now almost entirely dependent on civilians like Louis Nouveau, Georges Rodocanachi and Mario Prassinos. Nancy Fiocca (who lived in Marseille with her husband Henri) and Elisabeth Haden-Guest (who had arrived in February) were still making their contributions (along with many others) but Donald Caskie would soon close down the Seamen's Mission and leave in June. Richard Parkinson (611) Bob Milton (1039) and Winwick Hewit (1063) were sending most of the escapers from St Hippolyte south to Perpignan, where Bruce Dowding was established at the Hotel de la Loge, before they continued over the mountains to Spain. It is not clear when the authorities in London, specifically MI9 (aka Room 900) first became aware of the scale of Garrow's activities. Escapers were being debriefed in Madrid, Gibraltar and on arrival in London and almost anyone coming from St Hippolyte would have known the name Garrow, as would some of the men brought down from Paris and the north. 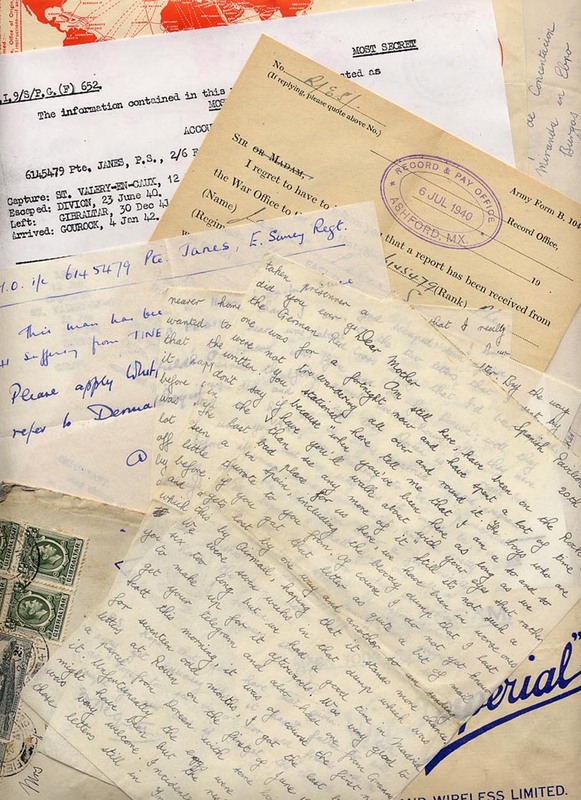 Donald Darling (Secret Sunday) says that one of his tasks in Lisbon was to contact Garrow in Marseille and send him some funds. Since Garrow's return message apparently included a reference to HMS Fidelity (see below) this could not have been much before April 1941 at the earliest. Airey Neave says in his book (Saturday at MI9) that by the summer of 1941, MI9 were sending Garrow money 'and other assistance' and there certainly seems to have been regular contact between Marseille and the Barcelona Consulate, and hence London. In August, Charles Murchie wrote from his prison cell in Barcelona to Sir Samuel Hoare in Madrid telling him that he had handed over 'the whole business of sending people to Spain' to Captain Garrow. Garrow says that after the inmates at Fort St Jean had been transferred to St Hippolyte du Fort, he ‘arranged' with a senior French officer to remain in Marseille on the excuse that he would take care of any British evaders who might arrive in the city. Garrow made a point of sending any such arrivals on to St Hippolyte since, for the time being at least, security at the Fort was lax enough that subsequent escapes were quite straight forward - and in the meantime, the French authorities would feed and shelter them. Unfortunately, this happy situation did not last long and in May 1941, the French authorities were pressured to tighten up security at the Fort and from that time on, Garrow did what he could to shelter evaders elsewhere. Garrow also discovered that despite receiving active assistance from the US Consulate in Marseille, the American authorities were also allowing an unnamed French detective access to British Consular files. From this, Garrow concluded that the French authorities were well aware of his true activities. As a precaution, Garrow made contact with a 'Juge d'Instruction' named Capitaine Dutour. Garrow told Dutour that he was only interested in the welfare of British evaders arriving from Occupied France, pointedly making no mention of any interest in their subsequent ‘repatriation'. Dutour apparently accepted an arrangement whereby Garrow could continue to work helping British evaders so long as he avoided any connection with De Gaullist elements - and that if he were to be inadvertantly arrested by the police, he should mention Dutour's name in order to secure his immediate release. In June 1941, Lt-Cdr Pat O'Leary (Albert-Marie Guerisse) arrived in Marseille. He had been stranded near Port Vendres on 25 April after a pick-up operation from HMS Fidelity failed. He and his landing party were arrested and wound up at St Hippolyte. Parkinson, Hewit and Maurice Dufour arranged O'Leary's escape and he made his way to the Rodocanachi apartment where Garrow had his headquarters. O'Leary was obviously intending to get back to England as soon as possible but Garrow saw this as an opportunity to recruit a fellow British officer who was fluent in French. I doubt that Garrow would have recognised that O'Leary spoke with a Belgian accent or that O'Leary would have confided that he had been trained as an agent by SIS. According to Brome (The Way Back) when Garrow sent a message to London for permission for O'Leary to stay in France, he addressed it to the Admiralty. The request was sent by courier to Spain and the positive reply 'Adolphe doit rester' was broadcast from the BBC in London at the beginning of July. Brome says that Adolphe comes from the name Adolphe Lecompte on the papers supplied to O'Leary by inmates at St Hippolyte but Harold Cole says that he supplied the identity card, originally issued in Lille to Madeleine Deram's husband, along with other supporting documents. The Marseille organisation could so easily have been destroyed on 16 July 1941 when the local police raided one of their regular meeting places at the Noailles Hotel. Pat O'Leary, Mario Prassinos, Elisabeth Haden-Guest, newly recruited Francis Blanchain and several others were swept up, and Tom Kenny was arrested two day's later at Cannes. What the BMA really wanted was the whereabouts of Ian Garrow, the man they now believed was running not just an escape organisation, which they could tolerate, but an intelligence network, which they could not. Most of those caught didn't know where Ian was and the few who did, weren't talking. Everyone was released within a few days except Elisabeth, Frances Blanchain and Tom Kenny who were held until November. On 10 October, Capitaine Dutour asked to Garrow to see him in his office at Fort St Nicholas. On his return from the meeting, Garrow was arrested by detectives in the Place de la Bourse. Garrow gave them Dutour's name but they insisted on taking him to a Gendarmerie where the Commissaire refused to contact Dutour. Garrow was interrogated by a man from Vichy and an official from the Surveillance du Territoire in his office at 59 La Corniche and that evening, Garrow was taken to Fort St Nicholas where he was held, without charge, in solitary confinement. It should be noted that the Germans had been trying to infiltrate the organisation, both in Marseille and the north, for several months. They knew that soldiers and airmen were leaving France and rejoining their units in England and so it seems reasonable to assume that in arresting Garrow, the Vichy police were acting under orders from the German authorities. One of the first questions put to Garrow was where was he living. Since his apartment at 13 rue des Phocéens held nothing incriminating, and that it was in the same tenament block as Nancy Fiocca, Garrow gave that as his address, knowing that the subsequent visit by the police would warn the rest of his organisation that he had been taken. In February 1942, Garrow had his first proper interrogation before a judge where the main question seemed to be the source of the funds that Garrow used in his welfare work. Shortly after this, Garrow contracted jaundice and was treated for about a month at the Michel-Levy hospital in Marseille, constantly supported by Nancy Fiocca who brought him regular food supplies in addition to weekly parcels arranged in London and sent from Lisbon. On being discharged from Michel-Levy, Garrow was returned to Fort St Nicholas, but no longer held in solitary confinement. Garrow was finally brought to trial on 22 May 1942 and sentenced to three years and six months solitary confinement. He was sent to a concentration camp at Mauzac-et-Saint-Meyme-de-Rozens on the Dordogne river, about twenty-five kilometres east of Bergerac. Visits by Nancy from Marseille were obviously difficult but the British authorities were aware of Garrow's situation and they continued to arrange for food and other comforts to be sent to him. By July Garrow's health was reported as being entirely satisfactory and his morale high. Following the German take-over of southern France in November 1942, Pat O'Leary left Marseille and moved his headquarters to Toulouse. It was obvious that Garrow was likely to be taken to Germany so O'Leary set about organising his escape. First of all Francis Blanchain was sent to reconnoitre the situation. Unfortunately he was arrested on his second visit to the area and although he escaped, was compromised. Meanwhile, Nancy Fiocca had managed to justify her continued visits to Mauzac by claiming Garrow was her cousin. Garrow had worked out that it should be possible for him to simply walk out of the camp diguised a one of the gardes nationale and so arrangements were made for a French NCO's uniform to be smuggled in. For Nancy's last visit to Mauzac, Pat O'Leary went with her, claiming to be her husband Henri, and while Nancy was inside the prison with Garrow, O'Leary delivered the bribe money to a prison guard named Peyrot at a nearby bar. The uniform was made by Paul Ulmann in Toulouse and the plan was almost foiled by a last minute change for the guards to gendarme's uniforms but Ulmann was able to make a second outfit in record time. The following weekend, while Nancy was establishing a high-profile alibi for herself in Marseille, O'Leary went back to Mauzac and delivered the uniform to Peyrot. On the evening of 6 December, Garrow changed into the guard uniform and walked out of Mauzac, his departure watched closely by O'Leary, Guy Berthet and Fabien de Cortes hidden nearby. O'Leary met Garrow and they ran to a car driven by Jean Bregi who took Garrow to his farm at Lunas. Radio operator Tom Groome was waiting for them and next day Garrow was moved to Bergerac. Later that month Garrow was brought to Toulouse and sheltered with Françoise Dissard. On 25 January 1943, Garrow was taken to Perpignan and across the Pyrenees from Banyuls by a guide from Jenner Wagner Dalmau's organisation, along with Pat Line radio operator Alex Nitelet and American evaders Erwin Wissenback (#11) and William Gise (#15). He reached the British Consulate in Barcelona on 1 February and on 5 February, he was in Gibraltar. Two days later Garrow was flown back to England. In May 1943, Captain Ian G Garrow received the DSO for his work in France. That same year he married Margaret Denholm Hay, whose brother James had been at Glasgow Academy with him. Garrow worked in London (at least part of the time with MI9) until the end of the war. He was confirmed in his war substantive rank of Major on 1 January 1949 and retired from the TA Reserve in 1958 with the honorary rank of Lieutenant Colonel. Ian Grant Garrow DSO died at his home in Lochearnhead on 28 March 1976.
and of course to the Garrow family.